At SMX in June, Gary Illyes surprised many when he mentioned that Google still ranked the desktop page for their mobile search results. Maile Ohye later clarified that while they do rank desktop, they do run comparison checks to ensure the content “matches up” between the two, so that someone can’t be spamming mobile users while desktop visitors see something else. Gary Illyes from Google commented on Twitter that while Google does use the desktop version of a webpage for ranking, it will still check for differences between the desktop and mobile version. There hasn’t been a lot of discussion about people coming across spam sites from those who are serving up mobile users something completely different. 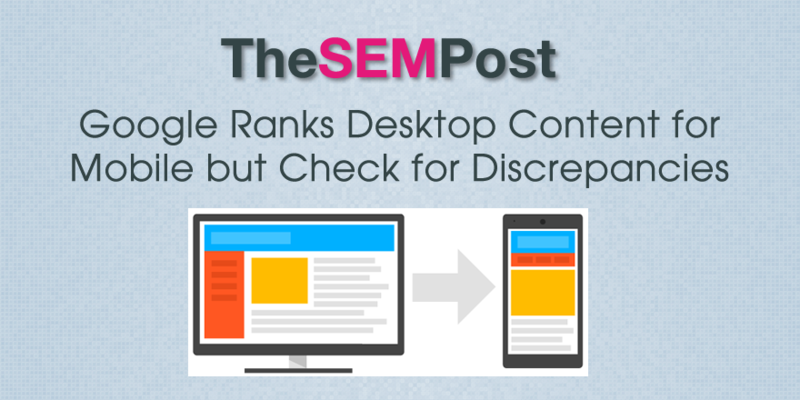 But it doesn’t seem to be widely known that Google does use the desktop for mobile rankings. In June, Illyes also said they specifically had the spam team look into whether it was a spam issue where users were serving something completely different to mobile users when compared to desktop, and not simply just an issue where some were serving a slightly abbreviated version of content to make it easier for mobile users to read and interact with. He said that they didn’t find any issues. So once again, if you have evil genius plans to spam mobile, do be aware Google checks for differences to ensure it is only normal changes you expect to see when sometimes lightening up content for mobile versus serving something completely different.